Walls can be either particles or polygons. 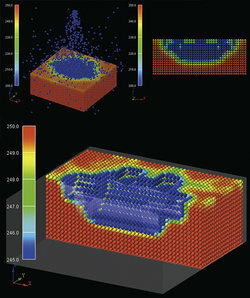 Particle walls allowing users to calculate internal temperature distributions, while polygon walls generally create a smaller memory footprint and allow for faster calculation. Movements can be set for both types of walls. Inflow boundaries allows for the generation of fluid or powder over time. The flow can be specified by its velocity or flow rate (volume). Inflows are movable. The mesh-free method allows the simulation region to be moved. This saves computational resources when simulating a large region, such as a waterway driving test. Periodic boundaries are also supported. The explicit method speeds up calculation by giving a suitable speed of sound. 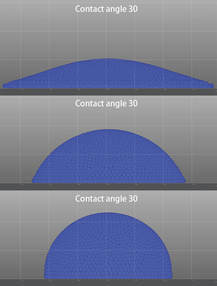 Spatial pressure oscillation can be suppressed using this function, resulting in higher accuracy . Unlike other particle-based methods, Particleworks can handle negative pressure with ease. Define the outside pressure or atmospheric pressure. 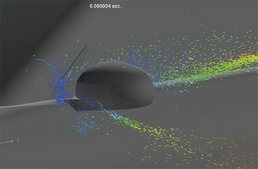 Particleworks can import data points calculated by external CFD programs (in CSV format), such as airflow field around a car body. This function is useful when analyzing the behavior of droplets with air resistance. Particleworks can simulate non-Newtonian fluids ‒ such as power-law or Bingham fluid ‒ as well as Newtonian fluids. For more detailed control over viscosity, you can specify custom functions or data tables. When simulating high-viscosity fluids, the explicit method tends to give a smaller time step, resulting in a longer calculation. In contrast, Particleworks’ implicit method maintains a constant time step, making it an ideal solution for such simulations. 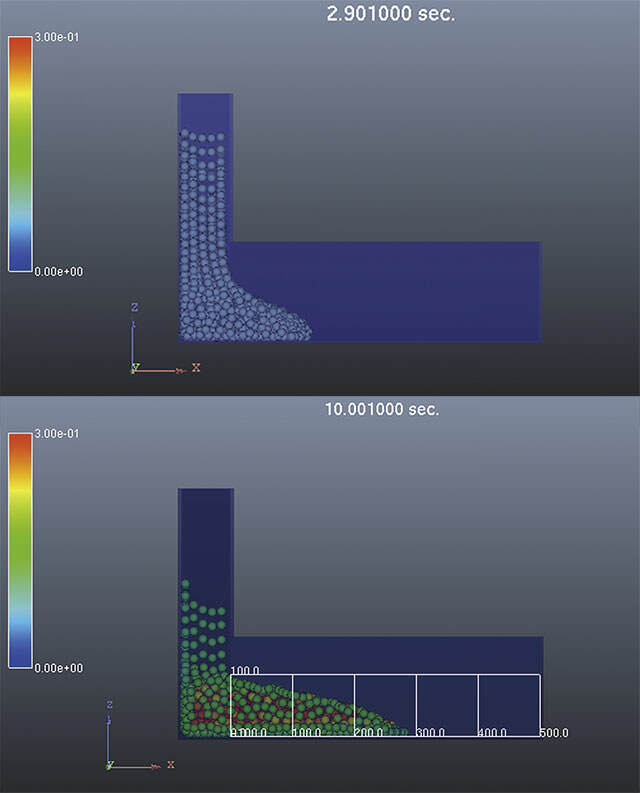 To simulate turbulence flows, Particleworks uses a hybrid model in which LES (Large Eddy Simulation) is combined with resolution enhancement near walls. Particleworks offers two models: The CSF model calculates surface tension from the geometric shape of the object, whereas the Potential model uses interfacial energy between objects. angles between two different states of matter, such as wall-fluid and fluid-fluid. 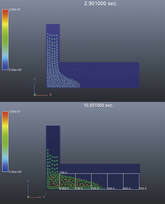 By specifying the magnitude of the attractive force, multiple non-mixable fluids can be simulated, such as oil and water. The interaction between complex flow and non-deforming objects or rigid bodies can be analyzed straightforwardly. 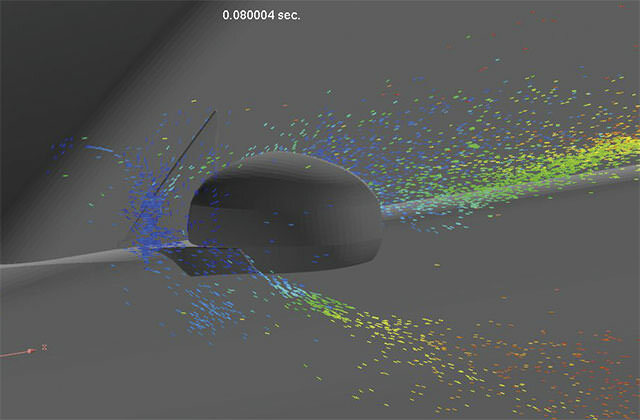 The 2D simulation option significantly reduces the number of particles used, resulting in quick computation. This feature is useful for simulating periodic phenomena such as a large tsunami, or for analyzing a cross-section of a domain. between solids and fluids, and you can set temperature-dependent viscosity for fluids and shear heating.